Following an article published by the daily Le Messager and speaking of a plot of assassination against Paul Biya and involving the French embassy, ​​the first authorities of the French Embassy in Cameroon, sent an answer. 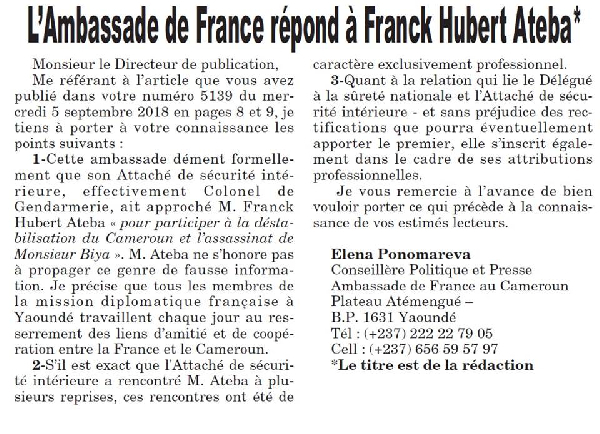 This one in a correspondence sent to Direction of the newspaper, is to deny this information, given by Franck Hubert Ateba, a former executive of the MRC. According to Franck Atéba, he was approached three times in a row by the Colonel in charge of the security of the Chancery. He was thus asked to take part in the assassination plan of President Paul Biya and his family. According to him, the head of security explained to him that Paul Biya is already too old, therefore, he is no longer himself to defend certain interests. Faced with its information published by the daily newspaper Le Messager, the embassy sent a right of reply in which, she formally denies her information.